In order to publish your library on JitPack you just need a working build file in your Git repository. 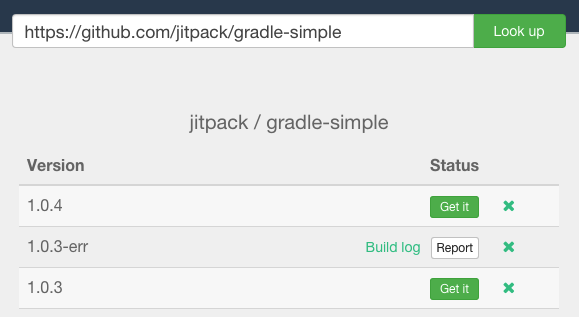 JitPack currently can build Gradle, Maven, Sbt and Leiningen projects. Let us know if you want to use it with other build tools. If the project has a build.gradle file then it will be built using Gradle otherwise JitPack will look for a pom.xml, build.sbt or project.clj file. The build.gradlefile can also be located in a subfolder. Note that if your project isn’t using a Gradle wrapper JitPack will build it with a recent version of Gradle. Therefore it is recommended to use the wrapper. to build and publish Maven projects. Your Maven group id is harvested from the top-level pom and then used to locate the installed artifacts in ~/.m2/repository. Binary jars, source jars and javadoc can all be picked up from there via the JitPack virtual repository. If the project builds multiple modules JitPack publish all of them. It will also generate a module that includes all of repository’s modules as dependencies. That way if you don’t know which module you want you can get all of them by adding just a single dependency to your build file. To get individual artifacts of multi-module builds use com.github.User.Repo as group Id and ModuleName as the artifact Id. Tip: You can see a list of modules on jitpack.io if you Look Up your repository. Note: If your project only has a single module then the dependency for that module is just com.github.User:Repo:Tag. JitPack can build sbt projects and also provide dependencies to sbt. libraryDependencies += "com.github.User" %% "Repo" % "Tag"
which will build the dependency with your current Scala version by calling sbt ++SCALA_VERSION. - echo "Running a custom install command"
The install command is expected to create build artifacts somewhere in the project’s directory andalso to copy them to the local Maven repository ~/.m2/repository. Custom environment variables can be set using the env section as key-value pairs. They will be available to your build on JitPack. Additionally, you can configure environment variables in the Web UI on https://jitpack.io if you have a private repository. Look up your repository and click settings. This is useful if you don’t want to store environment variables in git. JitPack will compile projects using OpenJDK Java 8. See the example projects on how to set a different target version in your build file. Maven projects that specify a target version in their pom will be built with that target version. If your project uses Travis or Circle CI then JitPack will read the lowest jdk version from yml file and use that to build. If your project requires a specific Java build then you can use Custom Commands to install it before the build. If there is an issue with a build you will see a link to the log in the Status column. You can also build snapshots on each commit if you add GitHub or Bitbucket Webhooks. On GitGub go to repository Settings -> Webhooks & Services -> Add webhook. The webhook will trigger a build for branches that you have previously used with JitPack. So make sure you have requested master-SNAPSHOT from JitPack before adding a webhook. You can remove builds that didn’t succeed if you Sign In on JitPack.io and look up your repository. Requesting them again will result in the project being rebuilt. You may need to run gradle with --refresh-dependencies flag in order to re-fetch the dependency. In maven use the -U flag. To clean the Gradle cache delete the HOME_DIR/.gradle/caches directory.